Initially, flip the table over on its top and step on the locks to ensure they go fully into the black channel lock. Insert to fit around freearm in flatbed position is sold separately, not included. *Your machine may not fit the opening. 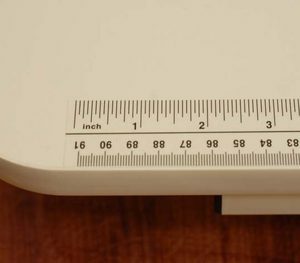 Please measure your machine and compare to the dimensions of the table opening prior to purchasing. This is a non-returnable item. Arrow and Kangaroo Sewing Machine Cabinet Selection. How to Choose! Ruler already attached. Handle below for lowering your machine into flatbed position. 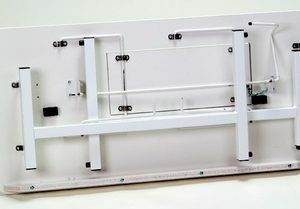 Sewing Machine shown in flatbed position with optional insert. Sewing Machine shown raised up to freearm position. 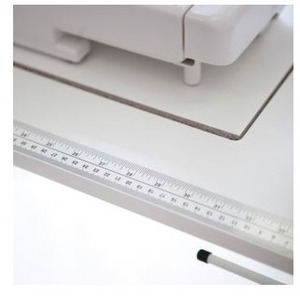 Inches and Metric Ruler on front lip of table. 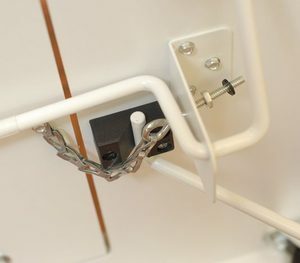 Two position lift mechanism. Flatbed flush with table top, and Freearm position with raised machine platform. Is the machine platform height adjustable? Yes, there is an eye-bolt underneath the bottom of the table that has a small nut attached to the bottom of it. This nut can be screwed in more to bring the level up, or unscrewed to bring it down. Some eye-bolts have 2 nuts on them or some just have one --along with a rubber stopper. Hi from Bonnie in the upper part of Michigan…I received the Gidget ll table approximately two weeks ago. It arrived 24 hours after I ordered it. WOW! Great service. I also ordered the acrylic insert which arrived yesterday. The acrylic insert fits perfectly on the lip of the table and when I adjust the height of the machine it will be perfect there also. So ….so far all is ok. Now comes the part of adjusting the height of the machine to meet the top of the acrylic table….I watched the video on it several times and the person giving the demonstration said all you have to do is adjust the height by turning the wing nut on the large bolt. I have done this and the machine still needs to come up to be level with the cabinet table top. I have two friends that have this table and one of them ordered hers just recently from you. When I asked her about adjusting the machine she said she had trouble adjusting it too as did the other friend who ordered her last Fall from a different vender. When I called the friend that just ordered from you a couple of months ago, she said that she ended of having to take off a couple of the links from the chain. Hello Bonnie, I am sorry that you are having difficulty adjusting the platform on your Gidget II table. Many people do have to shorten the right hand chain for standard sewing machines but we had to make the chain long enough for all the machines being put into the table. We recently filmed a video that shows exactly how to do that and have written some directions too. The attached help page tells how to determine how much you need to shorten. Please visit our web site www.arrowcabinets.com and select the Video tab, scroll down to Manual Platform Height Adjustment #1. The specific information starts at 2:22 showing removal of the screw with a ¼” hex socket (or needle nose pliers) and moving up 2 links to shorten the chain 1 inch. If you have other questions, please feel free to call our Customer Service line 800-533-7347. Hello to Jo at Arrow Cabinets and John at All Brands, Thank you so much for such good customer service. I just wanted you to know that the video on the www.arrowcabinets.com did the trick! It was much more thorough than other videos I had seen. Seeing as my sewing machine is a new one I had to take out two lengths to make it fit. I needed the visual before I felt comfortable taking off the extra links. I did not want to make any mistake on it. Once I used your easy directions for getting to the site and I watching the video, it only took me about 15 to 20 minutes to do the job from gathering the tools to getting the machine fit into its spot. I wish that I had accessed your arrow video site right away instead of thinking I had enough information in order to install it. 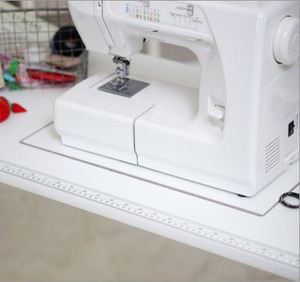 THANK YOU SO MUCH….Bonnie G.
I purchased two Gidget 1 tables and arranged them in an L shape to accommodate my sewing machine and serger. I use a swivel office chair to work between the machines. It is a perfect setup, since both tables are the same height. At first, I was concerned that since they are touching they might vibrate, but I can run both machines on high and the tables are totally sturdy and quiet. (Some reviews say the tables vibrate, but maybe those people didn't lock the legs in place tightly. I had no problem with shaking.) When I'm not serging, the second table becomes helpful workspace. And I also can combine both tables without any machines as a cutting or crafting table. The versatility is so great! I've always had a great experience with AllBrands. I was extremely pleased the table was exactly what i was looking for. I like the quality and it was affordable. i love my gidget 1. thanks! I referred your site to my sister-in-law so she could order. This table was exactly what I needed to hold my recently purchased Brother sewing machine from your company. I appreciate the promptness of the delivery. Thanks so much. 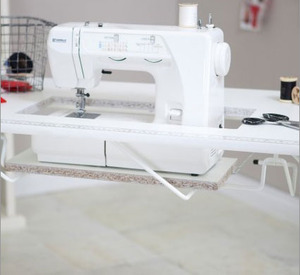 I was disappointed that this table had a different platform or sewing surface than the other Arrow Gidget 1 White Portable Sewing 601 Table I ordered last year. The sewing surface doesn't come up as close to the rest of the table. The lady at Arrow said it was better for the machine in the flatbed position. I was pleased in every way with the customer service and the quality of products that you provide. I was especially pleased with the speed of delivery during the holiday season. I would not hesitate to order from you again in the future. Online order was expedited quickly.Package arrived within just a few days. I am very satisfied with the product and service from your company. I will definitely order from AllBrands again and will recommend your company to others. Thank you! I love my new sewing table and the quick delivery. Very delighted with my purchase. The table was easy to operate and I put my sewing machine on it immediately and starting my quilting. As advertised, it was very sturdy and easy to use. Extremely happy I found your website. I received my Arrow Gidget table today and wanted to let you know how much I love it!! My machine fits nicely in the recessed portion - snug and secure. The table is just the right size and easy to set up. I am so pleased with my purchase! Very pleased with my order experience. Thank you! 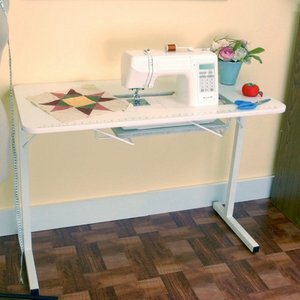 I just received my order of the "Gidget" sewing table. I am astounded! Best price, free shipping, on time, in perfect shape. You should be running Congress. Thank you again, great company!! I couldn't ask for a better product, price or speed of shipping. Great service! This was not my first purchase from you. I am always impressed at the speed of delivery. One of the reasons why I buy furniture from you is that is already assembled. I am extremely pleased with my purchase. The quality and the price are unmatched on the internet. I do alterations for a living and the table is a perfect extension of my current sewing table. I am very pleased with the service I received from this company. I have never before bought anything "on-line" & this was a very pleasant experience. The table is exactly what I wanted & the price was great. It was delivered before I even expected it to be. If I ever need anything else like this I will not hesitate to check with you first. I am very, very satisfied with the sewing machine table. Mostly because it can be folded and stored when not in use. Also it is so sturdy it makes sewing very easy. I am very satisfied with the sewing table. It was easy to adjust for my machine and I was glad it did not require assembly. It arrived in a timely manner in perfect condition. I would shop with Allbrands again. Thanks! Competitive pricing and order was shipped quickly. Thank you for your service. Thanks so much. A very nice procuct at a reasonable price. And, you didn't gouge me on the shipping like others wanted to do. I will definitly recommend your company. I am disappointed in one aspect of the product, that being that the inside of the hole the machine fits in is rough and unfinished. Shipping cost and speed were great!! I was totally amazed by how fast my item arrived! I was extremely pleased with my purchase from the initial contact to the very fast delivery of an excellent product. Thank You! The table is wonderful, ordering was easy, your tracking was great. I have recommended Allbrands to others! 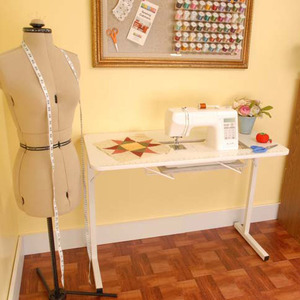 Hi - I just ordered an Arrow sewing table from your company. Just wanted to thank you for fair shipping rates. I almost made the mistake of ordering the same item from Sears. They are ripping people off for 90.00 dollars in shipping for the same item. So, I join your other customers that didn't get ripped off. Thank you for the great service on my recent order. I ordered the table on Sunday and received it on Thursday, and I must say that it is an excellent value for the price paid. I also appreciate how reasonable your shipping rates are - I comparison shopped this item at several other online outlets, and your combined price was lower by 30-40%. Thanks also for the UPS tracking information - that is always a plus when buying online. Does your machine have a knee lifter bar for presser foot lift?